CRETE—On the third day of the Holy and Great Council of the Orthodox Church, the Divine Liturgy was celebrated by His Beatitude Patriarch Irinej of Serbia at the Sacred Patriarchal and Stavropegial Monastery of Gonia. Afterward, the hierarchs continued their work in the sixth, seventh, and eighth sessions of the Council. In the sixth session, the hierarchs of the Council continued their discussion on The Orthodox Diaspora; in the seventh session, they focused on Autonomy and the Means by which it is Declared; and in the eighth session, they reviewed The Importance of Fasting and its Observance Today. 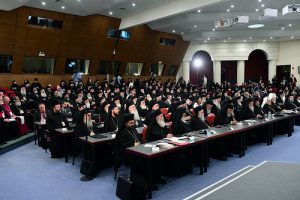 Following extensive discussion, various suggestions and clarifications were proposed by the Primates and individual hierarchs of the local Orthodox Autocephalous Churches. It is expected that revised texts that have been accepted by the Holy and Great Council will be signed in the coming days. In the afternoon, His Eminence Archbishop Job of Telmesos delivered an official news update on behalf of the Holy and Great Council. After the comments made by Archbishop Job, official spokespersons of the Ecumenical Patriarchate, the Patriarchate of Alexandria, the Church of Romania, the Church of Cyprus, and the Church of Greece gave a common press briefing, responding to questions from the press. To view a recording of today’s press briefing visit https://www.holycouncil.org/video. Visit https://www.holycouncil.org/live each day at 3:30 pm local Crete (UTC +3) to view a live news briefing. The Council continues meeting through June 25, concluding with the Divine Liturgy on June 26. As they become available, photos for use without modification or alteration are available at https://www.orthodoxcouncil.org/photos. All texts and homilies related to the Holy and Great Council are available at https://media.holycouncil.org/texts. There is nothing holy nor great about it. It is a Greek meeting and nothing more! This whole thing is a bad joke. No universal inclusiveness, no real iniquity, just a “Greek Thing!” What a shame!